The heart of this home is a spacious, cozy living room with windows to the beautiful magnolia outside. A well built and lovingly maintained home awaits on Bell Street. 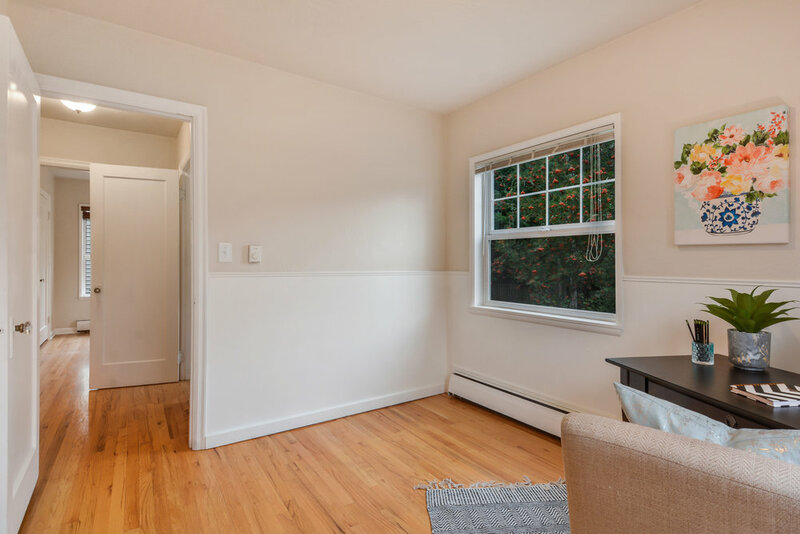 On the main floor the attractively updated bathroom, windows, and kitchen with its undermount sink in the stone counters bring modern comfort, while hardwood floors, coved ceilings, fireplace, bay windows, wainscot, and vintage hardware preserve original character. A finished basement including a family room, bedroom, bathroom and more greatly expands the living space. Outdoors mature landscaping with flower beds, a Magnolia tree, arbor, and a patio in the fully fenced back yard beckon you to enjoy the fresh air. 5 minutes or less to groceries at Fred Meyer, Tacoma Public Library, I-5 access, and Wapato Park. 6 minutes to Stanley & Seaforts with its expansive view of downtown, the port, and Commencement Bay. Continue on for the video tour, photos, neighborhood highlights (including drive times to a list of Tacoma favorites), and many more details about this home. A third bedroom easily used regularly, or as a guest room, or bonus room. 6231 S Bell St - the home faces west. A well maintained lawn, shrubs, magnolia tree, paving stone pathway, and tidy driveway welcome you to this home sided in cedar shakes. This living room is big enough for a sofa set and piano without feeling cramped. Don't miss the arched entrance into the dining room beyond. The living room as seen from the front door entry area. Notice the full bathroom through the opening into the hallway. From the outside, this west-facing home already promises to be welcoming. The magnolia tree, tidy lawn, and clean paint on cedar shake siding invite you in. Open the front door and pause to hang up a coat in the closet with its vintage glass knob, and step onward into the heart of the home. The living room is warm with oak floors, big updated windows, and a fireplace with contrasting white mantle and black tile hearth. With plenty of room for both a piano and a sofa set, this spot is a cozy gathering place located between the bedrooms and dining room creating a nice flow, while letting each space be its own. Oak floors, big updated windows, and a fireplace make a cozy living room. The shape, character, and light these bay windows create is lovely. Set a fancy table, or keep it simple, and casual, either way, this room is pretty. Through the arched entrance on your right when you first come in the front door, find the dining room. 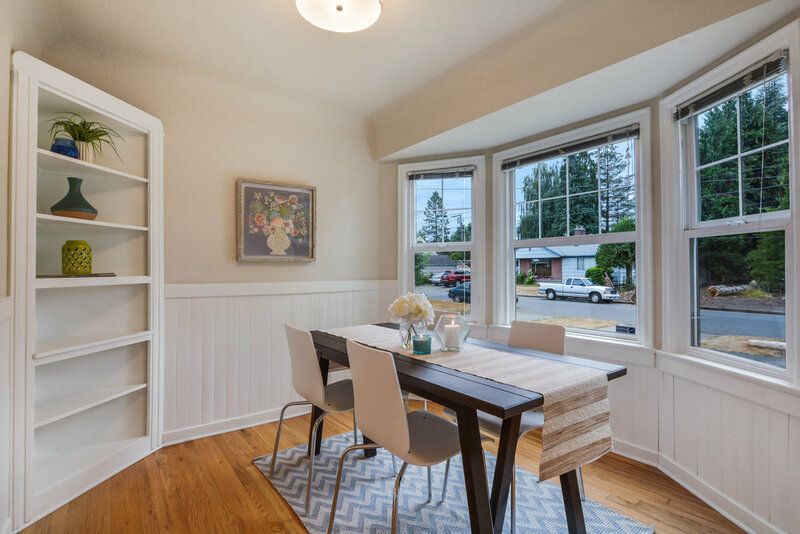 Bay windows brighten the meals enjoyed here, while white wainscot lends a quaint appeal. The windows easily slide up to open for breezes on warm days. A built-in corner shelf makes good use of space and offers a place for favorite dishes, plants, and photos. This room shares the same nice hardwood floors found throughout the living room and bedrooms. The dining room is located just to the right as you enter the front door. Bay windows, built-in corner shelf, oak floor, and wainscot create a very pretty room. The kitchen as seen from the entry to the dining room. Notice the stairs that head down to the side door and further to the finished basement. Classic white cabinets with contrasting hardware, stone countertops, and a full set of clean, white appliances make this room bright and homey. Connected to the dining room through a framed doorway, this kitchen is finished with stone countertops, pretty white appliances, subway tile backsplash reaching all the way to the clean and simple white cabinets with classic black knobs, and a neutral vinyl floor. A stainless undermount sink makes clean-up easy. Ample cabinets, good lighting, and a full set of appliances, including a sleek side-by-side refrigerator, complete a room that is practical, as well as appealing. 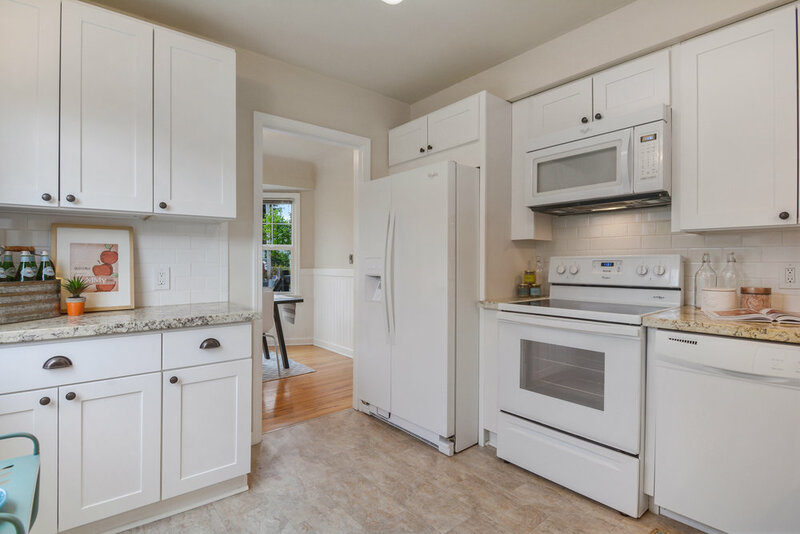 This kitchen is fitted with a neutral, easy to maintain vinyl floor that adds a touch of warmth to the clean, and sleek white of the subway tile backsplash, ample cabinets, and side-by-side refrigerator. One of two main floor bedrooms with nice oak floors, and windows to the back and side yards. Looking out from the 2nd main floor bedroom into the hall where the full bath and other bedroom are found. From the living room, head into the hardwood floor hallway leading to 2 bedrooms and a full bathroom. The bedrooms are simple and comfortable with oak floors, updated windows, and white walls. They’re ready for any colors you’d like to bring in. This second bedroom, set up as an office or writing room here, includes the pretty detail of chair rail molding, providing a soft change in tone in the upper and lower walls. The second main floor bedroom with oak floor, chair rail molding, warm neutral tones, and windows to the back and side yard. The second main floor bedroom with oak floor, chair rail molding, warm neutral tones, and windows to the back and side yard. This full bath is located in the hall between the 2 main floor bedrooms. With a clean, white tub surround, contrasting hardware, and a view to the Mountain Ash tree in the backyard, this is a very pleasant and practical bathroom. Between these 2 bedrooms on the main floor is the full bathroom. The island blue walls bring energy and character to this bathroom with its window to the back yard (don’t miss how pretty the reddish orange Mountain Ash berries look through the window!). A vanity with drawers and a cabinet mirror offer storage. Matching dark shower head and hardware offers a nice contrast to the clean white tub surround in the shower/tub combo. From the kitchen take four steps down to a landing with a side door out to a little covered porch along the paved driveway. Either head out, or turn and continue down the stairs where you’ll find a surprising suite of rooms in an artistic blend of stained concrete finished in dark grays, blues, and greens in a watercolor effect reminiscent of poolsides and tropical lagoons. Down the stairs from the kitchen find the finished basement with its artistic concrete floors that bring color and texture to the rooms. This room could be a family room, exercise room, play space or anything needed. Another view of the large basement room with its arched opening where you see doors to the storage room and laundry/bathroom. There's space for so much in here! The family room could be set up as a cozy place for watching movies, or playing games. It could be a space for exercise, a sewing room, or office. It’s really up to the needs of the homeowner. Just off of this room is a third bedroom space. Not currently fitted with a door, this opening into the bedroom could be made more private with curtains, or a screen. Whether used by a member of the household, or reserved for guests, this room adds versatility to the house. Another view of the bedroom in the daylight basement with its colorful floors, closet, and window. This convenient room includes a shower, toilet, and sink, as well as laundry. Add a table for folding laundry, or shelves along the wall. This room has the space for it. This laundry room, found at the base of the stairs is complete with a washer and dryer, lots of floor space, and a 3/4 bath. At the foot of the stairs is a laundry room and 3/4 bath with a washer and dryer, shower, toilet, and vanity with a sink. There’s quite a bit of extra floor space where shelving, or a laundry folding table could be added, or just room for laundry baskets. Whether the bedroom downstairs is used regularly, or just on occasion, it's truly convenient having a second bathroom in the house. The final room in the basement is this storage room all set with wire shelves to keep the rest of the house uncluttered. Just to the right at the bottom of the stairs is a storage room fitted with wire shelves all around the sides. Having a room like this is immeasurably convenient. It’s a place where extra pantry items can go, seasonal decorations, tools, or camping gear, and helps keep the other closets in the house from bulging. Set up your patio with a bbq, comfy chairs, an umbrella, and you're ready for family, friends, or just a quiet cup of tea. Rhododendrons along the back help the yard feel private and green. There are also some berries growing along the fence! One more view of the front of the home with its mature magnolia, rhododendrons, azaleas, and paving stone path. You can see just from driving up that this home’s yard is inviting. We already mentioned the beautiful magnolia growing out front and their are also nice plantings like hostas, rhodies, azaleas, and ferns in a bed surrounding the house. Paving stones create a pathway through the lawn from Bell St to the front steps, and an arbor covered in vines such as fragrant jasmine adorns the backyard gate on one side of the house. A paved driveway borders the house on the other side and leads to the detached garage. There is a low wooden fence here with another gate to the back yard. Through this gate from the driveway you can also take the stairs up to the little side porch and enter onto the landing just below the kitchen. The back yard is a homey place with a Mountain Ash tree bearing its bright berries near the patio. There are also raspberry canes, rhododendrons, and other flowers growing. It’s a nice balance of lawn, patio, garden, and path ready to be enjoyed. The back yard is a private place with trees, such as this Mountain Ash, landscaped beds along the fence (you'll even find some berries), and an arbor over the gate on the north side of the house. Wapato Park with its flower gardens, lake, paved loop trail, and off-leash dog park is just over a mile away. The Fern Hill neighborhood with its used bookstore, restaurants, library, and schools is a 4 minute drive from home. 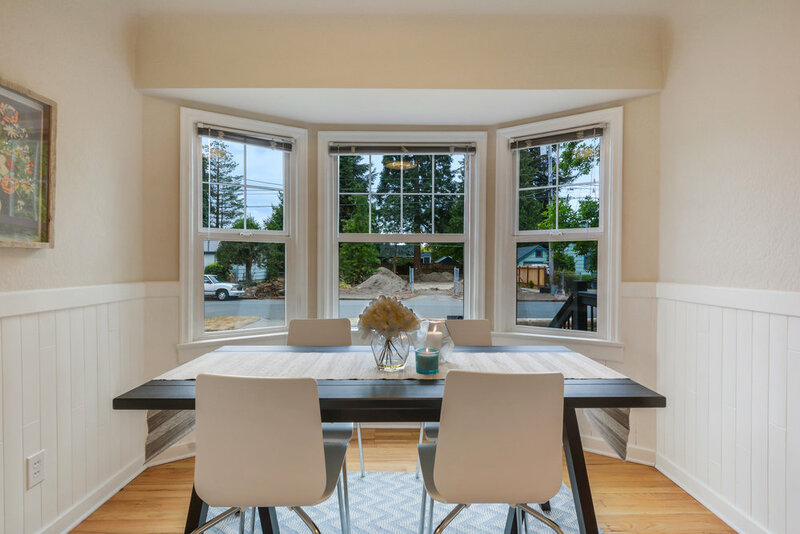 On a street shared by other well-maintained homes, this house is set in a place with a strong residential character, but is quite close to Pacific Avenue businesses like the Tacoma favorite Vuelve a la Vida, only 2 minutes from groceries, and 5 minutes from access to I-5. Take a look out our South Tacoma Neighborhood Page to learn more about this part of Tacoma. You can also delve into the Lincoln Business District, just 6 minutes away in our Take a Walk: Lincoln District article, and get to know the Wapato Off-Leash Dog Park in our Off-Leash South Tacoma article. If you're a bookshop lover, follow this Tacoma Bookshops: A 7 Stop Tour of Our City including several South End bookstores not far from this home. For drive times from this home to a list of Tacoma destinations, check out our list below. Don't miss a visit to the Top of Tacoma, one of the city's favorite bars with awesome food and lots of vegetarian and vegan options (meat too, of course!). For more information about this South Tacoma home, call or text me at 253-226-2787. I'll be happy to answer your questions about this home or the Tacoma real estate market in general. Come see this home in person at this weekend's Open House, Saturday, August 18th from 12 - 2 pm.